"To surrender in spiritualtiy and religion means that a believer completely gives up his own will and subjects his thoughts, ideas, and deeds to the will and teachings of a higher power." Hmm, maybe.... 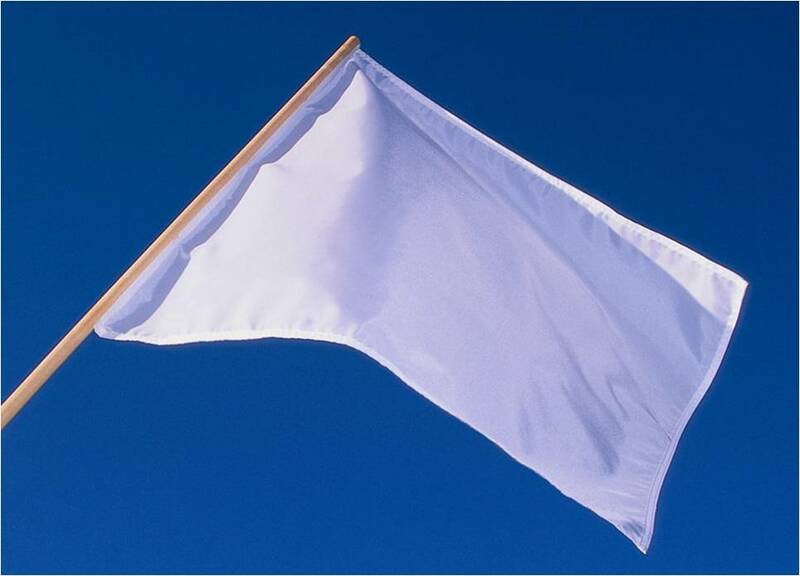 But the picture I can't quite get out of my mind when I hear the word surrender is of someone waving a white flag of surrender. The kind of flag flown when battles were being fought and lost in civil wars maybe. Or maybe even a scene from a wild west movie when the tavern is being shot up by the bad guys and someone sticks a white handkerchief out a window and waves it in an act to promote cease fire. The more I thought about it, the more I figure surrender means the act of giving up control. More particularly, giving up a false sense of control. In so doing, you actually gain control. If I go back to the tavern scene.... the handerchief of surrender is extended when you have run out of bullets anyway and you know you are completely outnumbered. Rather than really loose the fight, and perhaps your life, you decide to give up the false idea that you can protect or control something . The point is, you realize you don't have control, you can't win this one, so you extend the flag. But once extended, you actually do win. If the other side is playing by the rules, they stop shooting or fighting you. You are actually the one that calls an end to the battle and it would seem, in this way, you actually maybe come out the winner? http://pixiedusthealing.blogspot.ca/2013/04/a-new-paradigm-of-trust.html It's a place where you aren't attached to outcomes, or methods, but just find a place of peace. Not easy but well worth finding. I believe there are some Bach Flowers that can help you find this place of surrender. I include in this combination; Cherry Plum, Rock Water, Cerato, and Elm. Cherry Plum is included because it is the remedy for the fear of loosing control. I've written about this before. It's helpful when you are holding on so tight it hurts. The Cherry Plum state can be one of deep despiar where you fear you may lose control of your behavior, or are on the verge of a breakdown. It's the fear that if you start to cry you'll never stop. Cherry Plum can help restore your calm mind. It can help allow you to wave the white flag in the most rational of all acts. I also include Rock Water in the combination I'm calling "Surrender". Rock Water types set really high standards. They belief they have to defend the saloon no matter what and no matter the circumstance. They defend their sense of control because they can't really see another way to do it. Rock Water will allow some flexibility to your letting go. Who knows, maybe the new bartender can really make some great drinks! I don't think you can find the point of surrender without trust. And for that, Cerato is the Bach Flower to turn to. Cerato helps you listen to your higher self, your Crown Chakra, your place of knowing. Once you listen and believe in what you're hearing, you've found the place of peaceful letting go- and ultimate surrender. If you find yourself in a place to be considering surrender, you've likely been through a bit of a battle. No battle is easy and the energy involved can be immense. No doubt by this time you are feeling overwhelmed by the sheer responsibility. I think most people find surrender when they have exhausted their resources and got to the point of exhaustion. If that's the case, Elm can help restore your normal capable self. If taken before you "hit the wall", Elm might help you put things in perspective so you can allow yourself the luxury of letting go (surrendering) some of that responsibility so you don't get to the point of being overwhelmed. So, I think my personal definition for "surrender" would be "having the self trust to let go of those things overwhich you don't really have any control in the first place". Open the saloon doors and let in some new energy. OMG!. Thank you. Ahhhh....At at time when it is needed most the messages are coming and coming clearly. Blessings for the "letting go"! Hard to do yet so easy to accept!